Will Debt Consolidation Help ? If not, you have other options ! Contact is for a FREE, NO-OBLIGATION quote and apply now! I want to handle my debt right now ! I'd like a FREE consultation ! A+ Credit and Debt Help Center is the BEST choice to find a solution for your credit and debt problems. We are a budget analysis, guidance, and debt resolution agency. Our trained and friendly staff will take the time necessary to assist in finding a consumer smart solution especially for you, quickly and easily. First, we specialize in providing clients with an overall picture of their income, expenses, assets, & liabilities. From there, options are identified, pro's & con's are discussed, and PLANS OF ACTION are developed. 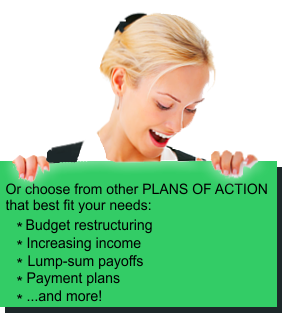 Finally, you, the client, are in a position to make an intelligent, informed decision to implement your FINAL PLAN OF ACTION. 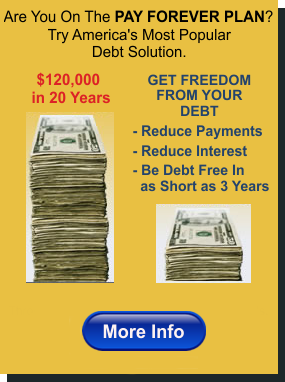 Your debts may be a simple or complex problem. Our agency offers a large variety of services, and depending on your needs, our caring, understanding professionals can help you, utilizing either our in-house resources and/or licensed professionals and organizations by referral. Rest assured that we can work with even the most difficult debt situations! 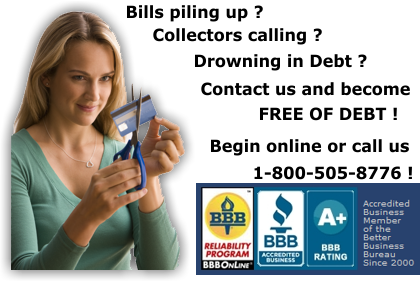 Whether you choose as your debt solution BUDGET RESTRUCTURING, or INCREASING INCOME, or A DEBT CONSOLIDATION PROGRAM (also known as DEBT MANAGEMENT or CREDIT COUNSELING) , or IRS OR OTHER PAYMENT PLANS, or LUMP SUM PAYOFFS, or SALE OF ASSETS, or REFINANCING OR BORROWING, let us be your NUMBER-ONE CHOICE to solve your debt worries. Additional services include credit freezes, or fraud alerts, or identity theft help, or death notices, or valid disputes, Clerical Services, and consumer credit reports and scores, including assistance with analysis and interpretation of your Equifax, Experian, & Transunion reports. Note: Throughout our website, we will be referring to products and services that are either provided directly by A+ Credit and Debt Help Association, and/or by referral to licensed professionals and organizations, which are duly licensed by Federal and/or State regulatory authorities and meet all of the standards established by their particular industry. As of 3/31/2012 A+ Credit and Debt Help Association no longer offers Bankruptcy related services such as Bankruptcy Educational Courses. You may contact a Bankruptcy attorney or a paralegal of your choice by searching the internet, or using your yellow page directories, for any and all legal matters that you may have as we do not provide referrals for legal matters.